Cahors Malbec: Feisty and Powerful, But Is It Marketable? I’m in Cahors, and it’s one of those thoroughly gorgeously sunny wine country days that at turns make me happy to be alive and secretly, maddeningly spiteful towards those who get to experience this nearly every day. Of course, those turns tend to come after long stints of travel when I’m severely under-caffeinated, so keep that in mind before you read too much into it. Also, Charles de Gaulle airport smells of rotting garbage, but that might just be from the massive number of over-traveled, unwashed people congregated in close proximity after their long flights. Ok, I really need coffee right now. Anyway, tonight (which will be last night, actually, by the time most of you out there read this) we kick off the International Malbec Days Festival here at the Pont Valentré with a pre-opening tasting event. In preparation, I’ve gotten a bit more info. on the aims of the event and its sponsors. Cahors is laying claim to the title of “Spiritual home” of Malbec (also known as Cot and Auxerrois in the general Sud Ouest). Its main competition now, of course, is Argentina, who now grows more of the stuff than France. Cahors has three main terroirs when it comes to Malbec (and they’ve been growing it long enough that I think we can safely employ the dreaded T-Word), and they equate roughly to the elevation of the vineyard terraces above the Lot river. 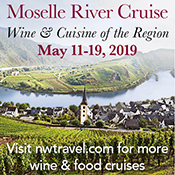 The closer to river-level, so the thinking goes, the more alluvial the soils and the less complex the wines (check out ReignOfTerroir.com for a great detailed exposition of these), and typically the higher proportion of other varieties (Merlot and Tannat) blended into the final product. These terroirs produce wines with different stylistic profiles, from simpler and fruitier (“Tender & Fruity” according to the marketing materials) wines close to the river, to “Feisty & Powerful” wines in the middle terrace, and finally “Intense & Complex” wines made from 100% Malbec. Theoretically, the price points follow suit as expected. 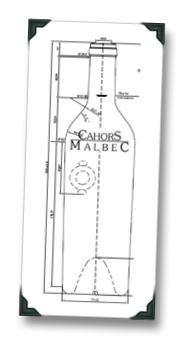 The marketing strategy is to make a push for Cahors wines to gain market share of Malbecs sold internationally, which they’ll primarily need to take away from Argentina, starting with the U.S. market (the goal is a 3-5X increase in sales in the U.S. within 3 years). The focus of this push are the “Feisty & Powerful” Malbecs, priced in the $15-$25 range, hitting the large East and West Coast U.S. markets. I suppose the cat’s now out of the bag that I’m a little skeptical, but I’m clearing a small space of my mind from concentrating on the secret spite of the recently-traveled, and reserving that space as “open mind” to be filled by the tasting notes of Cahors wines. Cahors Malbec is a great wine, but i think Mendoza Valley out performs…. "Cahor going head-to-head with Argentina…" and "cat's now out of the bag" sounds like a "paid for" advertisement by the Cahors government. Selling Malbec from Cahors is like selling Shiraz from Iran instead of Australia or making a big campaign to launch Anchelotta. Oy. To the inaptly named gent, it's not worth my time to insult you more than merely to say that in you the narrow-mindedness and laziness of the New World appears to be equal to that of the Old. Sorry for the tardiness of this reply, 1WD, but I was indeed referring to your poster Victor and not you. Enduring Texas's summer swelter, hope all's well with you.